You may be asking yourself, 'Why do I need to have my tires serviced?' At Meineke, we have a simple answer to this question - because your tires are some of the most important parts of your vehicle. When you service and maintain your tires regularly, you will get the most out of your vehicle's suspension system, handling, and overall performance. If you can't remember the last time you had your tires replaced or inspected, visit your local store today in Port Orchard WA Meineke #4374 for a full tire-fledged tire inspection. Keeping your tires in optimal condition is important for a myriad of reasons. First of all, well-maintained tires handle better on slick and uneven surfaces. Their ability to handle these surfaces means that you and your passengers are less likely to be involved in a collision. Tires also have a significant impact on your suspension system, and if they are not rotated periodically, you may have difficulty steering your vehicle. Tires are frequently overlooked by drivers, but the better your tires perform, the better your entire vehicle will perform. Stop by our Port Orchard, WA, Meineke #4374 store for a comprehensive inspection today. If you have older or damaged tires, you may be wondering about potential warning signs. Fortunately for drivers, many of these signs are easily observable to the naked eye. If you notice that your tires are punctured or cracked, it may be time to consider taking your vehicle to a tire change service provider. If your pressure sensor constantly gives low readings, even after you fill your tires with air or change them, your car may need to undergo tire pressure sensor replacement. Many of these issues are signs of severe damage, so call our Port Orchard, WA, Meineke #4374 location if you notice any of them. A flat tire leaves you stranded, pure and simple. Yet there are other reasons why you should ask yourself "Is there a good option for tire repair near me?" long before you ever get a flat. Avoiding routine tire rotations won't necessarily keep your vehicle from driving (up until excessive wear causes a flat, that is), yet it does limit their performance lifetime. Given the significant financial investment your tires represent, wouldn't you want to get the most out of them? Contact us at Meineke #4374 in Port Orchard, WA to learn how a low tire rotation can save you hundreds of dollars in the long run. If the tire pressure sensor light illuminates on your vehicle's dashboard, should that be an automatic sign that your tires need to be replaced? Not necessarily. Depending upon the current condition of your tires, a simple repair may be all that needs to extend their life and save you money. How are you to know? Finding out for yourself literally only takes a penny. Insert a penny into the tread of your tires, with President Lincoln's head facing downward. If any part of his head is hidden by the tread, your tires can still be used. If the dashboard light continues to go off, you may want to consider a tire pressure sensor replacement. 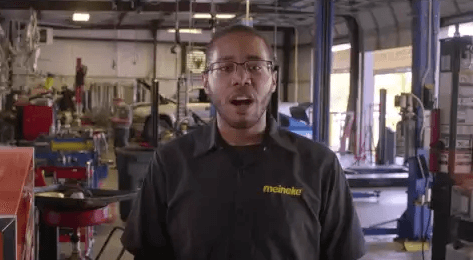 Any tire-related questions you may have can be answered by our friendly staff at Meineke #4374 in Port Orchard, WA. Drivers can expect high-quality service from us, but we also understand that tire repair cost and tire replacement cost are important to consider as well. If you are experiencing issues with your steering and suspension, you may also be curious about our tire rotation cost. We realize that vehicle maintenance and repair can be expensive, which is why we strive to offer some of the most affordable prices in the industry to our customers. Your local store may also offer various coupons and discounts. Call our Port Orchard, WA, Meineke #4374 store for additional information about our services.